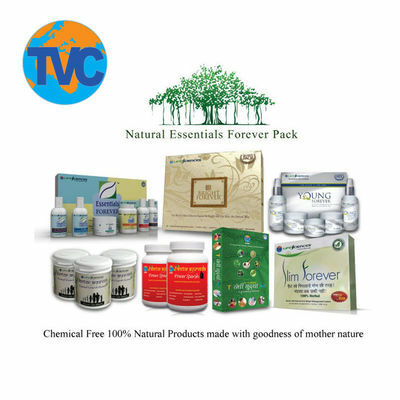 Buy Natural Essential Forever online - TVC Skyshop - Buy world-class innovative products at affordable prices offering full value for money. TVC Life Sciences research and formulation team conducted an intensive study on trees and shrubs in forests, which are consumed by herbivorous animals.For overcoming stunted growth, dwarfism & delayed convalescence. Tackling memory loss, dullness, debility & low stamina. Enhancing body growth, alertness, body energy, muscles & bone strength. So start taking DR. AYURVEDA NATURAL GROWTH FORMULA for your bright and successful future. Young Forever is a scientific comprehensive system for anti-aging, wrinkles and complete skincare. Its unique 5-pronged action cleanses, nourishes, rejuvenates, protects and eliminates dark circles. Young Forever fights aging & wrinkles by increasing the blood circulation and stimulating the collagen formulation naturally thus helping in repair of damaged cells. It nourishes, restores and strengthens the skin and keeps it healthy. A healthy skin is the first line of defense for a healthy body. Sandhee Suddham Plus is effective Ayurvedic treatment oil that has been used since ancient times to get relief from knee pain, all joint pain & arthritis. It is made from very rare Herbs and Medicinal plants found in the Himalayas and gently penetrates through the different layers of skin and increases the flow of joint fluid, repairs and strengthens the damaged tissues to make your joints strong and give quick relief from pain & swelling.Useful in treating Pain and Inflammatory conditions in wrist, elbow, back, ankle, knee, hip, shoulder and neck. Doctor Ayurveda Power Sparsh ignites mood and stimulates desire. Doctor Ayurveda Power Sparsh is made from Gold, Mulshi, Makardhwaj, Shilajeet, Keshar (Saffron) and other rare herbs. Doctor Ayurveda Power Sparsh is not a drug but a natural male enhancement herbal supplement. It is effective in igniting lost desire with its potent combination of herbs and other 100% herbal products. Power Sparsh for men does not contain any harmful chemical drugs and the only ingredients in Doctor Ayurveda Power Sparsh are those mentioned on the label. TVC Slim forever contains 4 scientific herbal formulations – well researched and clinically proven. This formulations made up of standardized herbal extracts essential and aromatic oils are * Dr. Slim Tea * Fat Chopper * Fat Drainer * Tummy & Body Trim Oil. This product in combination makes you Slim Forever naturally without any side effects. TVC Life Sciences has developed a scientific comprehensive system - Essentials Forever for your Skin Care, Hair Care & Body Care. Essentials Forever contains natural vitamins A, B, C & E , Aromatic essential oils, proteins, amino acids, enzymes, minerals, calcium, phosphorus, biological stimulators, glucosides, glycosides, fatty acids, esters, saponin, tannins, flavonoids, lipids etc. essential for our body. An Essential Forever does not contain animal fats, harmful chemicals like sulphates, bleaching agents, Petroleum products etc.